All proceeds of the auction of this necklace are going to support the building of Animikiiwajibikoong /Thunder Mountain Culture Camp Forever by helping the organizers to purchase building, camp & craft supplies. The camp is to have a permanent spot to bring elders and youth together for land-based language, arts, and traditional knowledge. Here's your chance to bid on this beautiful necklace! > Visit Zhaawano's art blog to read about the symbolic meaning of the above necklace. 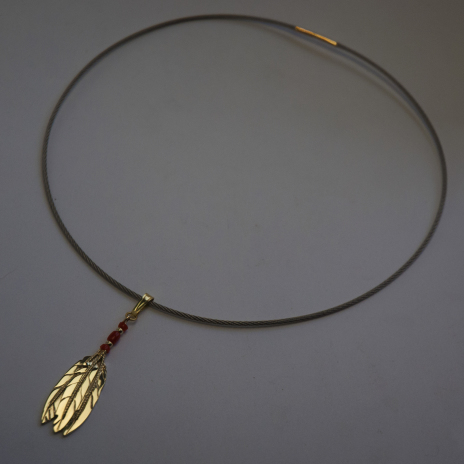 In this elegant necklace, the circular shape and the tightly woven material of the stainless steel choker necklace symbolize the circle and the unity strength of the Anishinaabe Peoples as a whole. 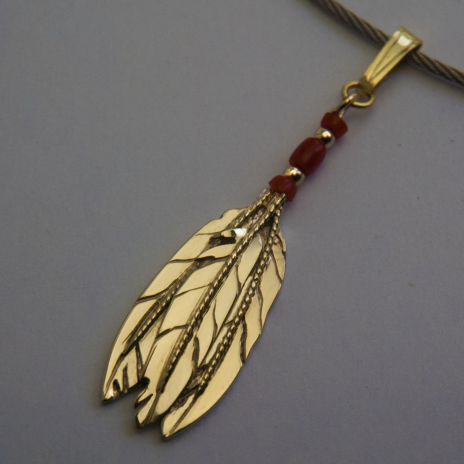 The three combined gold feathers of the pendant symbolize the founding of the historical Three Fires Confederacy, and, along with it, the recent revival of the ancient Midewiwin Lodge. On a deeper level, the feathers symbolize unity of Body, Mind, and Spirit. 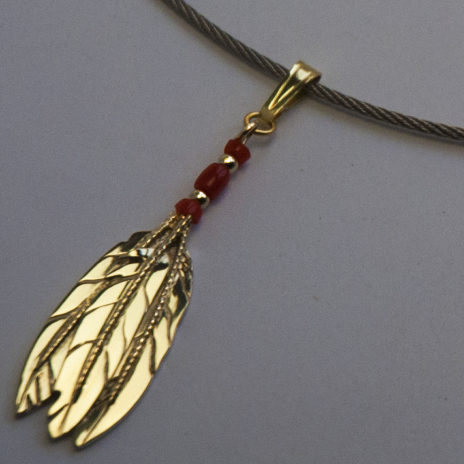 The deep red color of the three red coral beads adorning the upper part of the feather shafts represent the Sacred Ancestral Council Fire of the Anishinaabeg as well as the blood kinship and survival strength that binds them as a People, politically (the Confederacy) as well as spiritually (the Midewiwin Lodge). The red of the red coral represents all Peoples who come to the Lodge, not just those who are of Anishinaabe descent. Everyone is welcome to partake in the ceremonies as long as they are of sincere heart, mind, and spirit and show a life-long commitment to seek spiritual truth, knowledge, and healing through the Seven Teachings that the Grandfathers from the Dawn Land had passed on to the Anishinaabe Peoples before they started a two millennia-long migration journey from the shores of the Great Water in the east. Finally, the two gold dividers placed in between the red coral beads symbolize the realms of Earth and Spirit that converge in the rituals and ceremonies of Niswii-mishkodewin Midewiwin, the Three Fires Midewiwin.